Apparently these things are secretive about there lives. The fact that anything was found out about them is a miracle IMO. So I'm happy I was able to dig up something. The God of insects confirms my above statement. 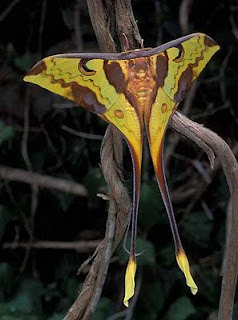 Actias maenas, also known as Actias leto, can be found from north-central India east to Malaysia and from there it ranges south to Borneo. The subspecies A. maenas diana can be found in Sumatra and Bali. Actias maenas is quite variable in coloration throughout its range. In addition, the females have much shorter tails and fewer markings, making them look like a different species. In the wild, larvae feed on the foliage of Averrhoa, Schima, Adinandra, Canarium, and Turpina but have been reared in captivity on many other species, including Cider Gum (Eucalyptus Gunnii) and Cucumber Tree (Magnolia acuminata). This huge moth prefers lowland forests and is not easy to find. Sorry for the bad English on this one I had to correct somethings ( no offense to the writer ). I will also look into the subspecies. Hopefully find a picture or two. Until next time!